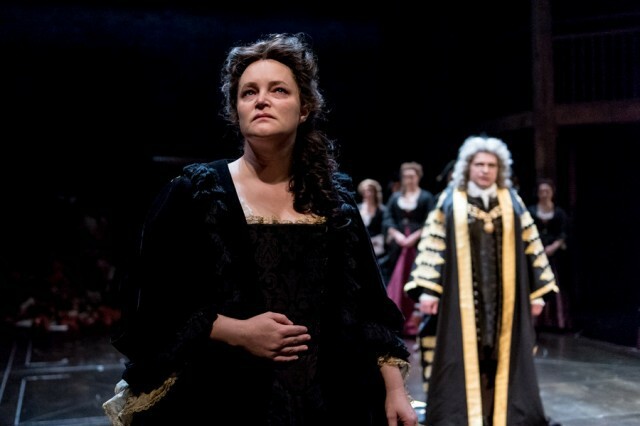 Following on from Wolf Hall and Bring Up The Bodies comes a new political drama from the Royal Shakespeare Company (RSC) set in the historic royal era of Queen Anne. Written by Helen Edmundson's, who was behind The Heresy of Love in 2012, Queen Anne follows Princess Anne as she becomes queen and the manipulative figures around her vying for power - in particular, Sarah Churchill, Duchess of Marlborough. 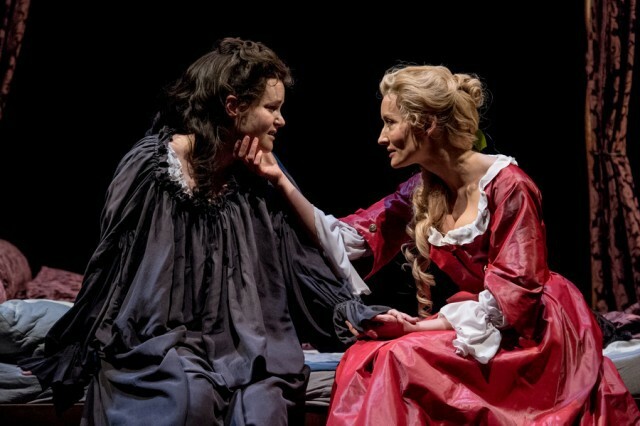 Anne's love for Sarah, their intensely personal relationship and how Sarah abuses this is the focus of the riveting play at the Swan Theatre in Stratford upon Avon. Weaved in to the plot is the clever inclusion of famous satirists of the time, including Jonathan Swift and Daniel Defoe, and their part in shaping public opinion. This adds a welcome light-hearted dimension to the production with songs and rude parodies on the court's dealings. 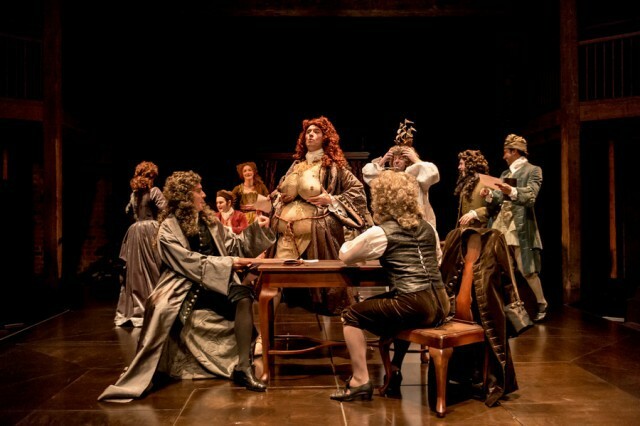 In the early parts of the play, Queen Anne is ridiculed as a pantomime dame character unable to give birth to a child but delivering a fart instead. Later, she's a puppet with the Duchess of Marlborough and her cronies pulling her strings. Tom Turner shines in these scenes as sceptical journalist Swift. 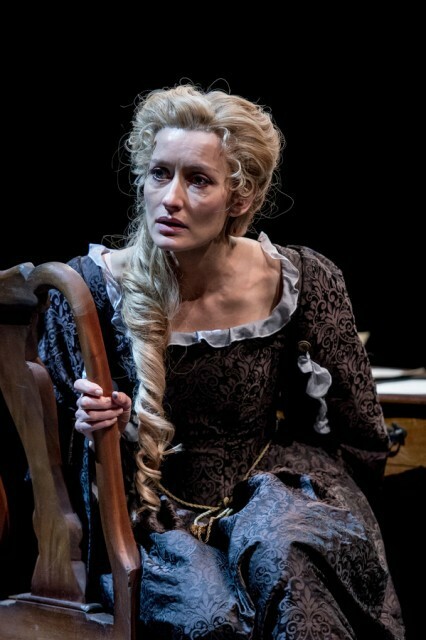 None shine as bright, however, as Emma Cunniffe in the title role. You may remember the actress from the 1990s TV series The Lakes with John Simm. She recently performed for the RSC as Mrs Darling in Wendy & Peter Pan two years ago, but is thankfully given this far more meatier role as Queen Anne. She is outstanding as vulnerable, ill Anne with trembling hands and a magnificent presence on stage. Her understated, natural performance makes Natascha McElhone's Sarah Churchill seem unsubtle and over-acted in comparison. Emma Cunniffe and Natasha McElhone star in Queen Anne. Photo Manuel Harlan. McElhone, a familiar face from films including The Truman Show and Solaris, is well-suited to the role of beautiful, conniving, icy enchantress Sarah, who has more than just the queen's ear. She plays the cool, calm, considered side of Sarah well but it's when her plans start to unravel that McElhone's performance lacks the passion of a woman who is falling apart at the seams. Set in the early 1700s, Queen Anne inherits an England that is at war. With a weak husband and plagued by illness herself, plus an unrequited obsession with her friend Sarah, she is a prime target for those with designs on power. Into the fray is thrown kindly, honourable servant Abigail Hill (an impressive Beth Park) whose relationship with Leader of the Commons Robert Harley shapes the future. In the same vein as Wolf Hall, this drama throws the spotlight on the inner workings of the halls of power when friendships are manipulated and betrayal leads to blackmail and deceit. Natalie Abrahami directs and steps up the pace after the interval when we see a more confident, determined Anne showing her full potential to realise where her true allegiances lie. It's a well-crafted play that benefits from a standout lead performance and will be of particular interest to those who enjoyed Wolf Hall. Tickets cost from £5 from the RSC website.